Degree of unsaturation (Index of Hydrogen Deficiency or IHD) is a measure to how many hydrogen atoms a molecule is missing in order to be fully saturated. A compound that does not have the maximum number of hydrogens per its structure is said to be unsaturated. What does it mean for a compound to be saturated? A molecule that has the maximum number of hydrogen atoms is said to be saturated. A saturated alkane’s molecular formula is as follows: CnH2n+2. For example, hexane (C6H14) is saturated but cyclohexane (C6H12) is not. Hexane and cyclohexane have the exact same number of carbons, but cyclohexane actually has two fewer hydrogens than does hexane. How do we determine degrees of unsaturation? On an exam, you might be given a prompt like this one: “Please provide the degree(s) of unsaturation for each of the following compounds.” Some of those might be molecular formulas like C6H14 or C6H12. For this type of problem, it’s easiest to start with a nice equation. In it, “IHD” will stand for index of hydrogen deficiency (also sometimes represented as DoU). So, now that we’ve got the formula, let’s apply it to our friends hexane and cyclohexane before testing other molecules. Are you ready for some good news? It turns out that determining IHD from a structure is actually even easier than doing so for a molecular formula. 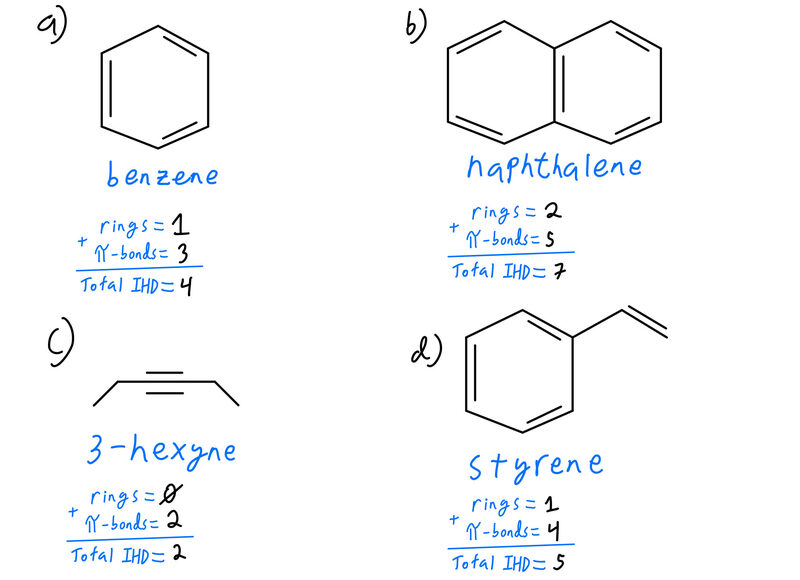 Here’s what you need to know: rings and pi bonds equal 1 IHD (two hydrogens missing). Let’s try working that out with hexane and cyclohexane and see if our results match with those of the formula. Okay, cool! So, even though hexane and cyclohexane have the same number of carbons, cyclohexane has one degree of unsaturation while hexane is completely saturated. Cyclohexane and hexene would have the same IHD since a ring is a double bond equivalent. What would the IHD of cyclohexene be? Cyclohexene would have two degrees of unsaturation because it has a pi bond and a ring. Calculate the degree of unsaturation in the following formulas. How many degrees of unsaturation are present in the molecules drawn below? 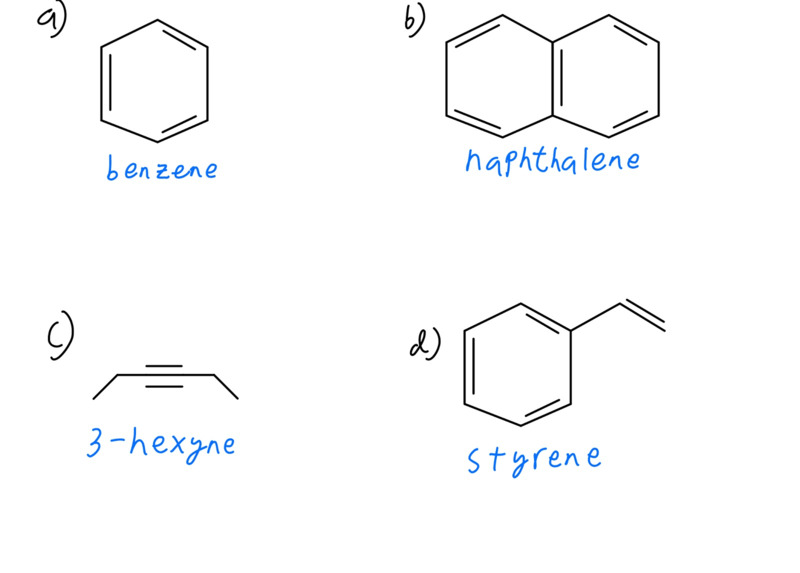 Let’s look at benzene, naphthalene, 3-hexyne, and styrene. Benzene has four degrees of unsaturation, naphthalene seven degrees, 3-hexyne two degrees, and styrene has five degrees of unsaturation. Alright! So, we’ve officially learned how to calculate the degrees of unsaturation of hydrocarbons. Your professor is likely going to ask about molecules including heteroatoms like halides, oxygen, and nitrogen. To learn how to calculate degrees of unsaturations for molecules with heteroatoms, check out my videos on Index of Hydrogen Deficiency. Hope this helps, and good luck studying! Johnny got his start tutoring Organic in 2006 when he was a Teaching Assistant. 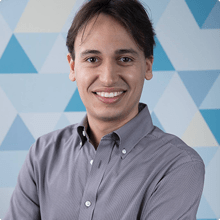 He graduated in Chemistry from FIU and finished up his UF Doctor of Pharmacy last year. He now enjoys helping thousands of students crush mechanisms, while moonlighting as a clinical pharmacist on weekends. Determine the molecular formula corresponding to the following structure. Calculate the number of degrees of unsaturation from the molecular formula and evaluate whether your calculations agree with the structure shown. A certain hydrocarbon has a molecular formula of C5H8 . Which of the following is not a structural possibility for this hydrocarbon? (a) It is a cycloalkane. (b) It contains one ring and one double bond. (c) It contains two double bonds and no rings. (d) It is an alkyne. Based on the trends above, answer the following questions about the structure of a compound with molecular formula C24H48. Is it possible for this compound to have a triple bond? Is it possible for this compound to have a double bond? Calculate the IHD, index of hydrogen deficiency, for a compound of molecular formula C5H9O2Br. Calculate the degree of unsaturation for C6H10S. What is the index of hydrogen deficiency of each of the following molecules? Determine the degree of unsaturation of the following formulas. Calculate the IHD, index of hydrogen deficiency, for a compound of molecular formula C12H18N3F2ClNO3. In each pair below, circle the compound with the largest index of hydrogen deficiency; circle both if the index of hydrogen deficiency is the same. Are there any cyclic alkenes with the molecular formula C 41H82? What can be said about the structure of the carbon skeleton of an aldehyde or ketone with molecular formula C14H28O? For the following formula, C7H10NBr, calculate the IHD and select all the types of unsaturation that might be present in the molecule based on the IHD. Are there any nitriles with molecular formula C50H101N? Are there any cyclic ethers with molecular formula C48H98O? Are there any cyclic alkenes with molecular formula C41H82? Alkane (A) has a molecular formula of C11H20. How many rings are present in alkane (A)? Alkane (B) has a molecular formula of C14H18. How many rings are present in alkane (B)? Can a molecule with the molecule formula C34H70O be a ketone? Could it be an alcohol? Could it be an ether? Why or why not? Which of the above sections of this molecule would be considered a saturated portion of the molecule? Which of the following molecules have a Hydrogen Deficiency Index of 2? Select all of the molecules that apply.